National Geographic A map comprised of Lake Superior, Lake Michigan, Lake Huron, Lake Erie, and Lake Ontario, the Great Lakes are the largest group of freshwater lakes on earth. 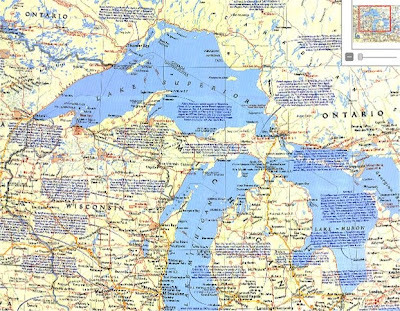 Published in July 1987 as part of the "Making of America" series, this map of the Great Lakes contains a vast amount of historical information about the region, as well as tourist attractions. It is half of a two-map set.